Unpaid Overtime Pro is unique in the app markets as it not only calculates the amount of extra hours an employee works, but can record and save the results to the user’s device. These results can then be sent as an email with attached PDF or shared through social media sites such as Facebook and twitter. As unpaid overtime is a growing social problem facing many workers around the world, this app has used social media sites for people to help spread the message to their friends and colleagues about the dangers of working unpaid overtime. The app gives the user accurate information about their current circumstances which can be used to take to their employers to help them gain compensation for the amount of extra hours worked. Step 1: Create a User Profile which is saved to your device. Step 2: Enter your current data. Step 3: Watch as Unpaid Overtime quickly calculates and compares your current income to your potential income. Step 4: Record and save the results to your device for tracking overtime. Step 5: Export the results as a PDF direct to your email and share the results on Facebook and Twitter. The “unpaid overtime” phenomenon is growing aggressively in this post-GFC world and it’s having a detrimental impact on the lives of workers, with a skewed work/life balance leading to serious health issues. Overworked employees can suffer from depression and other mental health issues, alcohol and substance abuse, a lack of exercise, unhealthy eating habits, disintegration of relationships and more. 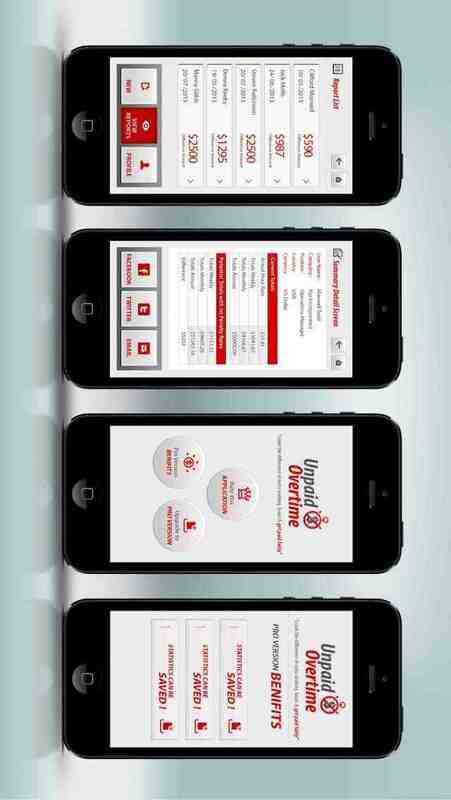 It’s an issue gaining increased social awareness and the Unpaid Overtime App is a simple, cost-effective solution. Unpaid Overtime is not only a great way to create self-awareness about the reality of your work/life balance, but doubles as a tool to provide a compelling case to take to your employer as you seek to be adequately compensated for any extra hours worked.